Vladimir Kramnik, as we know, has established his heartland in Dortmund, where he's won the Sparkassen Chess Meeting ten times, an absolute record. Last time he won was back in 2011. In 2013 English GM Michael Adams and in 2012 Italian GM Fabiano Caruana upset the King. 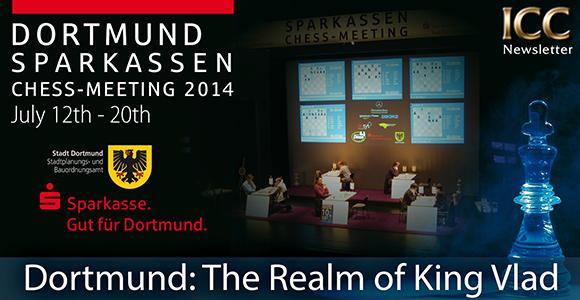 This year, from July 12 to 20, Fabiano and Michael will challenge again Vladimir in Dortmund. The line-up: Fabiano Caruana, Vladimir Kramnik, Michael Adams, Peter Leko, Ruslam Ponomariov, Arkadij Naiditsch, Goerge Meier and David Baramidze. The tournament is a 10-round double round robin. Play starts at 9:15 a.m . EDT. ICC will relay the games live and offer its members a round-recap video service.